This novel had a neat premise. Gilbert imagined the upbringing and life of a famous reclusive author, A.N. Dyer, and his sons. The story is mostly told from the point of view of the son of the author’s close friend, Philip Topping, who alternately felt rage and admiration for the “otherness” of the family. We are meant to draw parallels between J.D. Salinger and A.N. Dyer, though one knows there are few enough points of overlap. 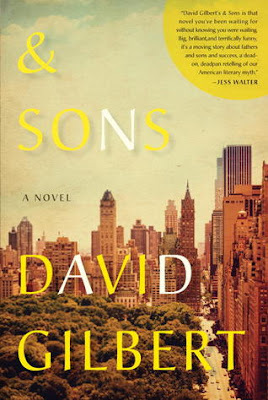 & Sons contains some pages from Dyer’s breakout novel, Ampersand , but beyond the fact that both are coming-of-age novels, Dyer’s work did not resemble Salinger’s in many particulars. I sensed a disturbing cruelty in Dyer’s work that I had no sense of in Salinger’s. And if Ampersand suffered from “emotional claustrophobia,” I am afraid I felt the same coming into the home stretch of & Sons. Gilbert created some marvelous set pieces for this novel, mainly the book party, fore and aft. A movie actor meets one of Dyer’s sons, a recovering addict, and demands he find some cocaine. That son calls his brother, who manages to whip up something special (not coke) and insert himself into the evening’s festivities. It was a clever piece of imagination, though to my mind it was carried on a trifle long—the jokes got crude and cruel--lessening my fascination. It is entirely normal to feel a little curious about a person who changes the way we view literature, and I admit to some curiosity at times for the life of Salinger. But I also have a certain sympathy for someone who knows himself/herself well enough to wish to limit the celebrity aspect of their lives. I hope he wasn’t as lonely as he seemed, or as lonely as Gilbert’s parallel figure, A.N. Dyer, seemed to be. I thought I had read some other things by Charlie Huston, but now I don’t think I have. Huston’s American crime novels have a noir quality that is unlike anything I have seen before. To say his writing is clipped does not really encompass the extent of its abbreviation. It is thought fragments. One of his main characters, Jae, tries to make connections or linkages between ideas and information coming from widely disparate sources. Trying to understand his characters’ conversations is a little like that, too. Skinner is current. It mentions the Tsarnaev brothers, for goodness’ sake. And it has lots of very alienated folks—unusual folks that are outside the mainstream. For that reason, it feels futuristic. These folks apply a great deal of cerebral muscle to take the technology we use every day to the next level. However, meeting so many unusual people in one book made me feel a little alienated. I felt as though I were reading about comic book characters, which is another of Huston’s fields. But let’s go to the heart of the mystery: I loved it. I loved the concept, the endgame, the central core of the story. It plays out beautifully, and mocks the gatekeepers of “security” in this age of terrorism. It has us rooting for the disenfranchised among us, and tells us to trust our overseers less and trust our own judgment more. Part of the story features the slums of Mumbai, India and part is played out throughout Europe and in the cyberspace occupied by American security companies contracted to defend the United States. I can’t help thinking a very good companion book is a very serious and important book of sociology produced by Katherine Boo, called Behind the Beautiful Forevers: Life, Death, and Hope in a Mumbai Undercity. In that book Boo shows us the [almost] limitless survival capacity of slum dwellers who have nothing to lose and everything to gain by innovating to live. Skinner carries the same theme. In the end, I felt this was a very masculine voice talking to other masculine minds in a sort of video game mentality and graphic novel sort of jargon. His female character was aberrant, as were many of his male characters. They had a quality of unreality. For the reason that I could actually see in my mind’s eye the graphic depiction of his scenes, I found it interesting. It seemed less like literature than amusement, but that’s probably what he was aiming for. It’s been years since this book came out. It made such a big splash on its debut I feared it may be popular fiction of a type that doesn’t interest me. I waited a little, had a peek, retreated. A big book in the vernacular of adolescent boys: a wave of exhaustion overcame me. Gradually I began to notice that many people whose reviews I follow were finding it an exceptional read. I took another look. No. Still couldn’t ever seem to find the time to wade through the (what I am embarrassed to say I thought at the time) triviality of the thoughts of fourteen-year-olds. The voice I had in my head as I read was inadequate to this opus. Out of frustration for my lack of understanding the significance of what others were enjoying, I bought the audio of this, performed with great brio, skill, and cognizance by Nicola Barber, Fred Berman, Clodagh Bowyer, Terry Donnelly, Sean Gormley, Khristine Hvam, John Keating, Lawrence Lowry, Graeme Malcolm, Paul Nugent, produced by Audible, Inc. Suddenly I experienced what I had been missing. This has to be one of the very best audiobook performances I have ever heard. This is also a classic of literature, worthy of all the kudos heaped upon it, and many more besides. If I could place it next to another book of comparable stature, it would be Salinger’s The Catcher in the Rye. Salinger’s was slim and this is comparatively huge. But Murray makes his words count. The four parts are named after video games. I believe Hopeland is an invention of the author, but Skippy finds details in the game seem to reflect his own challenges. The other game names may also be inventions, but there are real games out there with those names & the challenges sort of follow along with Skippy's. They may, however, have been created after, and as a result of the novel rather than having been referenced by Murray. Heartland (The Heartland has fallen under the rule of the ruthless tyrant Midan and his minions...). Ghostland (The blood elves applied the scorched earth policy to these woodlands...). Afterland (a traveling carnival of magical misfits in the afterlife). Every review I have seen mentions its size as a stumbling block. Pity. It takes days, weeks even, to get to it all, but after having lived with the boys and teachers of Seabrook College for some time now, I am convinced this tragicomic masterpiece is one of the great books of the new century. Funny, tragic, sad, true, and painfully revealing, it addresses major themes of our times and reminds us, with lacerating humor, just how it is to be young today. The ferociously hormonal boys central to the drama are engaged in the epic battle we all face but prefer to forget: how best does one grow up, today, in a world of global warming? To a fourteen-year-old, the gloom this question casts is rarely acknowledged but manages to shadow thoughts of the future. Murray captures the idiocy of youth, how they are so unsure of themselves, yet feel immortal at the same time. The cast of characters is positively Dickensonian. Murray peoples an embattled Catholic boarding school with an administration loathe to lose paying students to competitors yet fully aware and conspiratorially silent about the school’s deficiencies; teachers involved in personal dramas struggle to inspire the teens in their charge while warily watching and abetting the administration in their deceptions. But he is funny, really funny at the same time he is tearing your heart out with the stories of the boys trying to make their way in such a world. Howard, the history teacher, stays on the subject of the First World War for much of the term. The following riff could be taken for one of Murray's central themes, just by substituting global warming for WWI. "In today's History class, Howard the Coward--who looks like he hasn't slept much lately, or washed, or shaved--wants to talk about betrayal. 'That's what the war was really about. The betrayal of the poor by the rich, the weak by the strong, above all the young by the old. "If any question why we died / Tell them because our fathers lied" --that's how Rudyard Kipling put it. Young men were told all kinds of stories in order to get them to go and fight. Not just by their fathers of course. By their teachers, the government, the press. Everybody lied about the reasons for war and the true nature of the war. Serve your country. Serve the King, Serve Ireland...[Robert] Graves's friend Siegfried Sasson called the war "a dirty trick which had been played on me and my generation"...'"
And what of the White Goddess, who makes appearances throughout the story? The muse is an embodiment of the White Goddess, a cycle of desire and destruction. One will always desire her but one can never possess her lest she lose her power to inspire. Those that survive her ravishment will eventually pass to the Black Goddess who represents enduring, reciprocating love. A reader might take this to mean that if one manages to "take the road less traveled by" and overcome their desire for the ultimately meaningless trifles that are the result of 'wealth creation', one might finally reach a higher stage of consciousness featuring enduring love. This is how I feel now, after having reviewed and revisited this work for some weeks. I feel quite as though a gigantic wave has crashed over me and Murray has broken through to another dimension. It is a fabulous experience…Ruprecht would be happy. An interview with Paul Murray speaking to Jesse Montgomery gives us the mind of the author. He speaks the way he writes: he is funny, but he reminds us of the darkness surrounding us and our lives of plenty. “I think the tragedy of the world at the moment is that it’s more and more intent on turning us all into teenagers and making us long for this period in our life when we were totally at sea.” He reminds us of responsibility: of our tendency to act the “kidult” when what we really need to do is, each of us, take personal responsibility for the world we have created. There is more on his new project on a Farrar Strauss Giroux blog here.